Spend a Sunday morning in the fresh air and sea breeze, cycling along narrow trails in the islands of Gorai, Uttan, and Manori with a team of like-minded cycling enthusiasts. 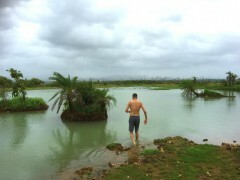 You'll get to see the misty mangroves, enjoy sea views, and even do a section of off-roading/mountain cycling at the rocky perimeter of Manori island. You'll also stop at attractions like the Global Vipassana Pagoda and the Uttan Light House, and enjoy a tasty breakfast at the U-tan Sea Resort. This cycling trip near Mumbai takes you along a 28 kms route, so you should have moderate to good fitness levels. 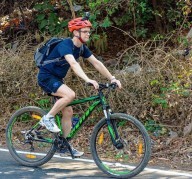 NOTE: This ex-Mumbai cycling trip includes cycles and helmets for the ride. If you wish to bring your own bicycle, the package cost will be INR 1500. Gorai, Uttan, and Manori are semi-island beaches separated from Mumbai by narrow channels of water and receding swampland. The clean sandy beaches are a holiday favorite and the region enjoys a pastoral lifestyle, with little to no major urbanization. On this trip you’ll also stop to visit the famous Global Vipassana Pagoda and explore the tall Uttan lighthouse, even climbing all the way to the top for an unparalleled view of the Arabian Sea. The peaceful, well maintained roads of the island have very light traffic, making them an ideal cycling choice. 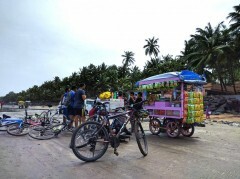 • Spend Sunday morning on a cycle by the sea. 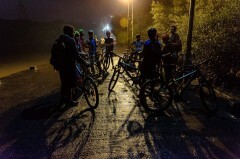 • Cycle 28 kms from Mumbai to Gorai, Manori, and Uttan. • Visit the Global Vipassana Pagoda and Uttan Lighthouse. Helmets are compulsory. Riders without helmets will not be allowed to participate in this cycling trip near Mumbai. If you're bringing your own cycle but need to rent a helmet, please specify this at the time of booking. There will be a charge of INR 150 per helmet that will have to be paid in cash at the start of the trip. You will not be allowed to participate in this trip if the instructor deems you to be ill or under the influence of narcotics or alcohol. There will be no refunds in this case. For cancellations made 48 hrs or more before the departure of this cycling trip near Mumbai: 50% of the cost will be refunded, minus any transaction charges. For cancellations made 0-48 hrs before the departure of this cycling trip near Mumbai: No refund. 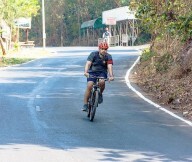 Participants need to have basic to moderate levels of fitness for this cycling trip near Mumbai. 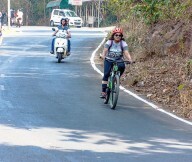 During this cycling trip near Mumbai, the decisions of the lead cyclist are final. The operator reserves the right to modify or cancel the trip without prior notice if deemed unsafe or necessary. 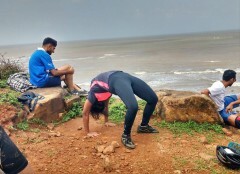 There is no pick-up for this cycling trip near Mumbai. 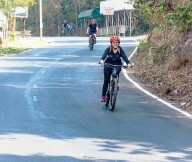 Helmets are compulsory; riders will not be allowed on this cycling trip near Mumbai without one. Arrive at Borivali Biryani Centre promptly at 6:00am to receive your bicycles and attend your briefing. 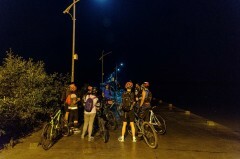 You’ll pedal to the Gorai Jetty and catch the ferry across to Gorai with your bikes. From the jetty itself, your cycling adventure begins. You'll cycle along mangrove-lined roads to the Global Vipassana Pagoda. Here you take a short breather before continuing upward to Uttan, to the famous lighthouse. You'll take a break from cycling to climb to the top and get views of the Arabian Sea before continuing on your tour. Proceed from here to the U-tan Sea Resort, where a hearty breakfast awaits. Afterwards, you'll head Manori beach, where you'll do some fun off-roading around the rocky perimeter of beach. You'll head back to the ferry point and ride back to Mumbai to drop your cycles off at Borivali Biryani Centre. Your cycling trip near Mumbai ends here. • Please carry any personal or prescribed medication as necessary, also please carry a personal first aid kit. You will have to report to Borivali Biryani Centre by 06:00 hrs. This is a restaurant in Borivali West, and can be reached by public transport.